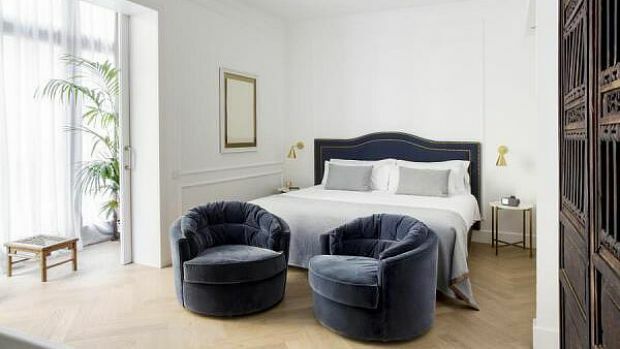 Located in the center of Barcelona, close to Las Ramblas and Passeig de Gracia Acenue, Hotel Midmost is a short 20-minute drive from El Prat Airport. From the outside it appears as though little has changed at Hotel Midmost, despite the passing of the years. Early twentieth century design flourishes abound, with wrought-iron French balconies, and a large dollop of Barcelona's trademark gothic style featuring heavily. Inside, ribbed ceilings speak to the property's lengthy history welcoming guests. The 56 modern and luminous guest accommodations have benefitted from a recent renovation, creating a soothing environment from which to explore. Guests can avail of complimentary Wi-Fi Internet as well as the aforementioned French balconies that open onto the street, or inner patio of the hotel. Traipse up to Hotel Midmost's roof and another of the hotel's strengths is immediately apparent - the stunning rooftop relaxation area. Here, a pool and solarium offer a fantastic daytime lounging spot, while the Terrace Bar presents the perfect spot for some quiet evening libations. Send an availability request with your requested dates to the Hotel MidMost Barcelona.